Camera making is a strange racket; you just never know what's going to hit and what will miss. Being first means almost nothing. In 1959, Nikon introduced the F, which established Nikon as a professional-level maker and heavily influenced Japanese cameras thereafter. It wasn't the first anything, but it was massively successful. This is another example. Nikon and Chinon both had autofocus SLRs but this is the camera people bought; this camera blew the doors off everything else at the time and almost killed the manual-focus market overnight. It took Nikon and Canon years to catch up; Pentax and Olympus never quite managed. Contax ignored it completely and remained manual-focus. But for Minolta there would be a price. The original Maxxum logo has the two X's interlinked and Exxon successfully sued. 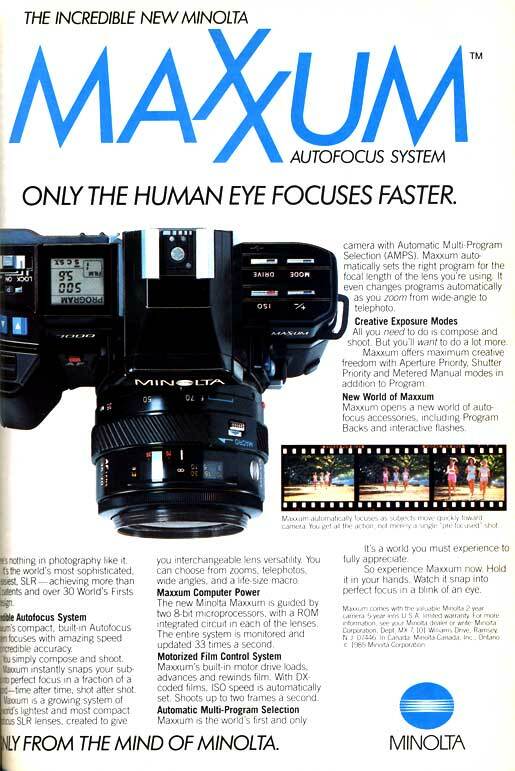 Then it turned out Minolta's autofocus infringed on some Honeywell patents, and they paid heavily for that. Ultimately, even though they were a major player in the 1980s and 1990s, they weren't able to keep up when the market went digital. In 2006 the parent company, Konica / Minolta, sold the camera division to Sony, which markets it under its own name.